p> What makes a great family holiday destination? You want lots of activities and adventures that the entire family can enjoy together. And, as important, enough fun activities to keep children occupied while the parents enjoy local attractions on their own. With amazing beaches, hiking trails, parks and mountains, Cape Town is a playground for children of all ages. Cape Town is famous for the quality and variety of its beaches. Take the family to Clifton and Camps Bay for chic sunbathing on sugar-white sand at one of the most beautiful beaches on the plant. For a more active beach experience, check out Muizenberg. Nice waves and warmer water makes this a beach ideal for bathing, with lifeguards keeping a watchful eye. This is a good beach for Frisbee or beach volleyball, but the preeminent sport here is surfing. Boulders offers a unique experience your family won’t forget. Located near Simon’s Town, this beach is home to a colony of penguins. Swim with the penguins or climb the large granite rock formations a real treat for kids of all ages. 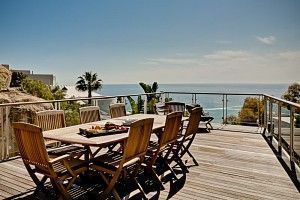 Cape Town accommodation is definitely not in short supply and there is a plethora of hotels, bed and breakfasts and Cape Town villas available to rent. Most of these spacious holiday havens come standard with gardens and swimming pool, a nice extra to keep the kids occupied. Two Oceans Aquarium, at the V&A Waterfront, will have children happily gawking at the galleries for hours. The aquarium’s Atlantic and Indian Ocean galleries, among others, provide a superb survey of the aquatic life off South Africa’s coast. And if you’re feeling brave, you can even dive in the predator tank. An emphasis on ecology and conservation make this an unusually educational day out. The wondrous World of Birds is the largest bird park in Africa . It houses over 400 species of birds in walk-through aviaries. Come face to face with exotic bird species in this nature haven in Hout Bay. There are also mammals and reptiles, and few kids fail to be delighted by playing with the squirrel monkeys. The V&A Waterfront is Cape Town’s premier destination for shopping, with much more to do besides. There are boutiques selling luxury men and women’s fashion and there are toyshops, surf stores and other essentials for children and teens. After shopping, grab a bite at the food court or enjoy a gourmet meal at a fine restaurant. End the day off with a movie either of two cinemas. From the Waterfront you can take a sunset cruise in the harbor. For a more serious and historically engaging nautical experience, take your children to Robben Island, to get a unique insight into South Africa’s past. This is a small sample of the array of fun activities available to kids and adults in Cape Town. With to suit all budgets, and families of any size, your family vacation in Cape Town will be an experience of a lifetime.